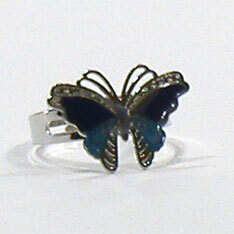 Polished and framed ½ inch Butterfly charm with ADJUSTABLE bands. Wings are responsive and sensitive mood detectors that change color and intensity with the mood of the wearer. Nicely finished. Adjustable bands. Sold by display box. 24 rings per display box.